When Google announced their version of iPhone’s messenger app – (Google Allo and Google Hello) we shouted it to the world (well, the #EventProfs world). When the phone of ‘yesteryear’ was released – (aka the Nokia 3310) we did the same. When most up and coming events, trends, or technologies are presented – at MeetingPlay – our goal is to always keep event professionals Intune, alert, and on the forefront of the latest event tech trends and news. Once upon a time, Facebook’s Mark Zuckerberg attempted to purchase Snapchat for $3billion. Believe it or not – Snapchat declined the offer, and how did Facebook respond? Developing a similar ’24-hour photo-story solution’ into Instagram, which Facebook had then procured. Once upon a time, Facebook’s Messenger app lived inside of the Facebook app. There was no ‘separate app.' It was a great alongside feature that didn’t require additional space, downloads, or any other necessities when utilized on one’s phone. However, in 2014, Facebook began making their messenger app – an additional app to the Facebook app – a mandatory download. The crowds went wild, but eventually, it stopped there. While it was an additional download for once a ‘feature alongside another feature’ – because Facebook was such a primary source of communication, eventually and reluctantly, the downloads of “Messenger” began. What was different between Facebook’s messenger app, and even the required download, and the recent launch of “Facebook Messenger Day” – is the fact that Facebook owns Instagram. Instagram’s ‘stories’ was a direct competitor with the infamous Snapchat. It was a 24-hour ‘story’ where someone could upload photos and videos that after 24 hours would disappear. No one thought Instagram’s approach – obvious replica of Snapchat – would be successful – however, it was. (Let us remind all the event professionals reading this – Facebook owns Instagram). Thus, why didn’t Facebook stop there? Facebook was lucky enough to nearly, and perhaps exactly, replicate what they once tried to purchase (Snapchat), into their recently acquired Instagram app – but still felt it was necessary to add the feature, separate from Instagram, into Facebook Messenger. 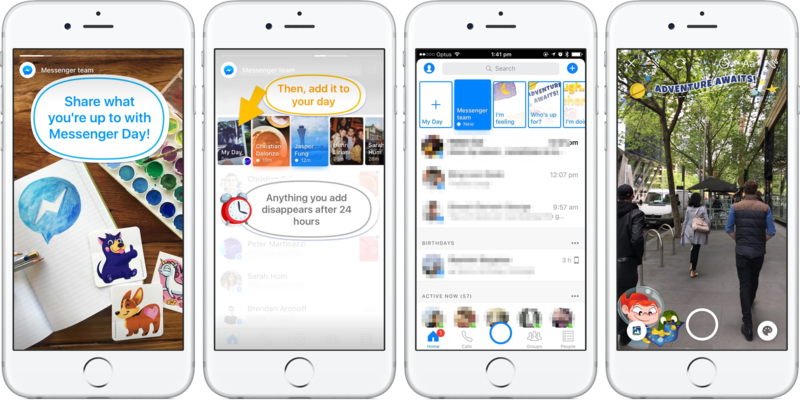 By now, most event professionals have probably become aware of the Facebook Messenger Day component to their messenger app. It’s on the top of every messenger screen – or at least, at one point had. It seems as of writing, March 13, 2017, that component has been taken down. Perhaps Facebook has already realized what a tumultuous and egregious attempt “Messenger Day” was. So, What Does This Mean for Event Professionals? While perhaps no event professional needs to run, and share their event photos (or announcements, or any attempts at event engagement, whether before- during or after) – perhaps there’s no harm in also incorporating it into your next attempts at event marketing either. While Facebook’s “Messenger Day” may be shortly lived – the likes of Snapchat and Instagram Stories have surpassed the ‘unexpected’ circumstances. They had lived on when the social media world certainly didn’t expect it. And both, rather all, are one more way to engage and inform (and encourage attendees to do the same), the world of events. Social media is an excellent mechanism to entice audiences and attendees. Social media allows attendees to be informed of events – it allows attendees to follow along and join a conversation via a hash tag. Social media truly allows event planners and meeting planners to create the event experience before events, leverage it during events, and carry the conversation and excitement after the event. Meeting apps and apps for events are a great way to connect with attendees – and incorporate social media efforts and attempts into one connected story. Curious to learn more about how MeetingPlay can help connect the story of your event?